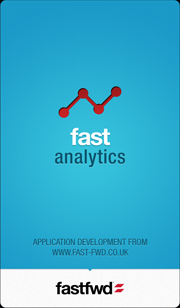 Fast Analytics is the premier app for viewing Google Analytics™ data on your mobile. We make it fast, simple and fun to see the numbers you need, when you need them. 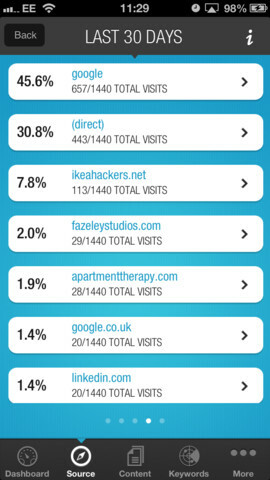 Visitor browser, country and engagement reports. Requirements: iPhone, iPod Touch or iPad with iOS 4.3 or above. WiFi or cell network connection and a Google Analytics ™ account required. First impressions are really good for this app. I've got my personal site set up here and a few of my clients sites too. I tried a few google analytics apps, but nothing lets me switch accounts this easily, so I'm giving it five stars. I love how simple it is to use and how the overviews show what you really want to see at an instant. Ace. I like it so far - simple app but does it all very well. Our customers told us that other Analytics apps are too heavy on the data - making it difficult to navigate through the screens to find anything meaningful. We developed Fast Analytics to focus on bringing real value by giving you the key numbers, without having to search for them. By taking the view that in-depth stats analysis is something best done on the desktop, our approach is to give you Fast access to the headline data, easily and intuitively. 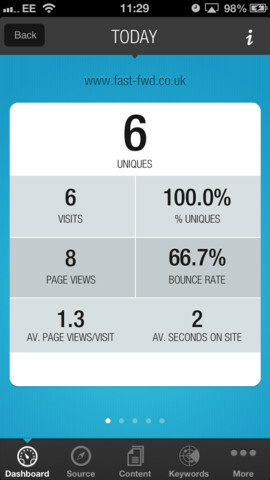 We believe Fast Analytics is the best looking and the most intuitive Google Analytics™ app on the market. It really is a pleasure to use and built by a team that value your feedback so we can make the app even better in the future! We are Fast Fwd Multimedia Ltd. - a Digital Agency in Birmingham, UK. We design effective websites, and build technically complex internet applications. As you can see, we also develop iOS Apps for the iPhone, iPod Touch and iPad. We have clients in several countries, ranging from international insurance service firms, to independent high street retailers and private individuals. We also work for other Agencies, helping them fulfil large projects and handling the technical delivery of their products to their clients. Let's have a chat. Start by getting in touch with us via the fastfwd website or the contact tab of this site. 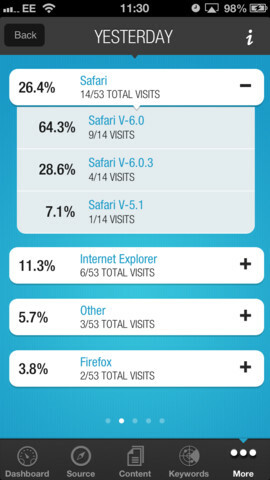 Open in Safari option when reviewing source of visits or keyword searches. 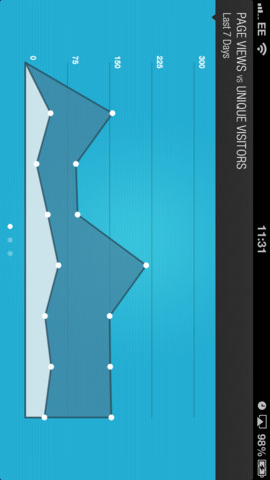 This app is provided for your enjoyment and to give you an overview of your Google Analytics™ data. To access that data we ask that you authenticate yourself with your username and password directly with Google's servers, via a special webpage displayed within this app when you first create a new account. Your authentication, as recommended by Google, uses OAuth 2.0 which does not expose your password to us nor to this app. Instead, a token is sent from Google to this device and stored so that you do not have to re-authenticate with your username and password every time you request updated Analytics data. This app does not collect or harvest your private Analytics data. The token remains private on this device and will be backed up to iTunes® during the normal device backup routine that occurs when you synchronise with your computer. You can remove your Analytics account from this app at any time. When you do, the app removes the Analytics token from your device and sends a de-authorization notice to Google, so that the token also becomes invalid. We are committed to your privacy and ask that you get in touch with us directly if you have any privacy concerns. We want your feedback. Tell us what you like, tell us what you don't like, and tell us what you would like to see! Copyright © 2011-2013 Fast Fwd Multimedia Ltd.